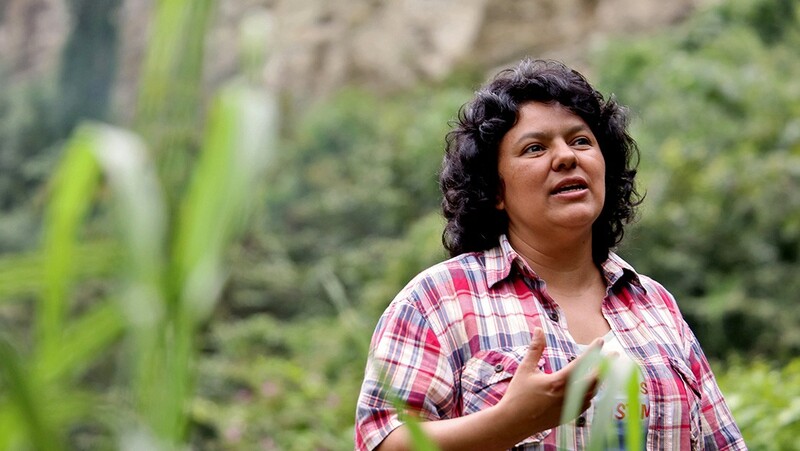 March 3 2016, Planet Earth — In 2013, during one of many moments when Berta Cáceres was in hiding due to constant death threats, I wrote an article called Berta Cáceres is Still Alive. There was every reason to believe that the Honduran state, the corporate oligarchs, the dam-builders, the mining companies, the timber companies, the agribusiness interests, the trade interests and all of the economic interests behind the ongoing plunder of lands and resources in Mesoamerica, wanted Berta dead. Today, they got what they wanted. 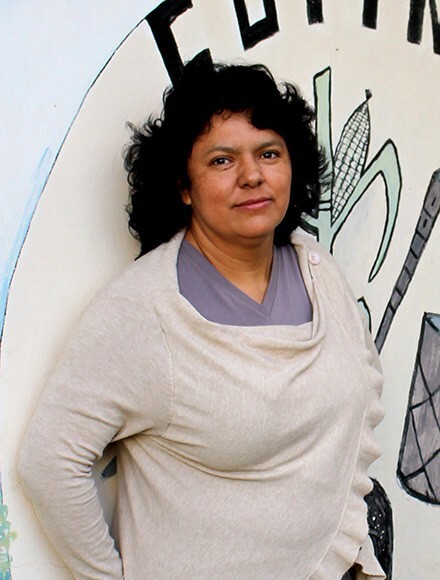 Berta Cáceres is dead. After more than two decades leading the Council of Popular and Indigenous Organizations of Honduras (Consejo Cívico de Organizaciones Populares e Indígenas de Honduras — Copinh), Berta, fearless and tender indigenous leader, visionary and fierce defender of the rights of Mother Earth, was murdered in her sleep by gunmen who entered her home on the night of March 2, in Honduras. Berta was not a woman destined to die of old age. For her fearless opposition to the plunder of her homeland, Berta was the most wanted woman in Honduras and everybody knew it. This does not make her death any less awful; to the contrary, it makes our struggle to defend the earth all the more urgent. Berta was not killed by lone gunmen. Berta was killed by greed, by plunder and by the state and corporate elites who stop at nothing to extract every last drop of blood from the earth and its defenders. And everybody knows it. Let this sink in: Like many before her, Berta expected to be killed for the cause. So we should not be surprised that they killed her. Enraged, aggrieved, wounded and sickened, yes. Surprised, no. What is a surprise is that Berta lived as long as she did, won as many environmental victories as she did, and gained as much attention as she did, when so many around her were killed. Juan Pérez. Williams Alvarado. Tomás Garcia. Cristian Anael. Madrid Muñoz. Margarita Murillo. Jeanette Kawas. Carlos Antonio Luna Lopez. These are just a few of the names of those killed in Honduras for the crime of defending the earth. A few of the names of those who must not be forgotten, as the name of Berta Cáceres must not be forgotten. In their 2015 report “How Many More?”, Global Witness counted 116 land defenders killed in 2014, twelve of them in Honduras. Since 2002, at least 111 environment and human rights defenders have been killed in Honduras. Now, 112. How many more, indeed? On February 20, Berta and 200 members of COPINH were detained near the village of San Francisco de Ojuera following a protest against the Agua Zarca Dam. The protesters, including children, were taken off of buses by military and police, and the buses were impounded. The protesters were forced to walk five hours through areas with a heavy paramilitary presence. Speaking to Radio Mundo Real while in arbitrary detention that day, Berta said, “We demand respect for the right to mobilize and speak out, the right to walk towards the Gualcarque Rio to defend life and Lenca territory.” Berta specifically named one of the company engineers and the Mayor of Francisco de Ojuera for having threatened the group. Berta was not killed by lone gunmen. She was killed by plunder, by exploitation, by all the economic and political forces that enslave and upend the natural world in the name of profit. If we are moved by Berta’s killing, it is our work to hold the actors behind these forces accountable. We should all be as fierce, determined, visionary and brave as Berta was. Let’s let that sink in. And then let’s get to work.